Last week I handled something badly at work, and I’m still beating myself up about it. Since I don’t think that posting the details on the Internet would help (see tip #142), I’ll just say that it amounted to embarrassing a colleague by copying others in on an e-mail that implied criticism. Yes, I know I say in my book not to do this! Sometimes I don’t know what gets into me. But in penance, I’ll give you the benefit of my experience: I've learned, and continue to learn, that when you have a problem with a colleague, it’s best to address the issue directly with that person and only that person. Until you’ve tried that a couple of times without results, don’t go elsewhere (especially not higher) with your complaint. This isn’t merely kindness; it’s also a better way to resolve an issue. The private communication allows your colleague to focus on the problem rather than on saving face. It helps forestall that escalation of blaming we so often see in public figures who are publically accused of some misstep. My own misstep ended well because of the grace and good nature of the person I e-mailed, so it’s time for me to let go of it. But I’ll keep it in mind; next time I might not be so lucky. It, Them, . . . What's the Diff? Last year I had a problem with ants in my kitchen, but at the hardware store there were several different kinds of poison and each package said, “Will kill this kind of ant, but not that kind.” So I went back home to figure out what kind I had. When I was able to speak, I thanked him and explained that there were actually more at home. Unfazed, he showed me what I needed and I went home to slay the ants. The moral (yes, I’m determined to relate this story to writing and editing) is that a failure to choose our words precisely is not usually a matter of life and death, nor is it usually very funny, although in the rare instance like this one, it could be both. In any case, care in word choice is almost always a good idea. Don’t query a word or spelling or locution without looking it up. If a writer uses an unfamiliar word or spelling more than once, it’s very possibly intended. It’s easy to paste “eat one’s cake and have it, too” into a search engine and learn that the writer doesn’t have it backward. Don’t waste a writer’s time by continually asking for approval. (“Okay? If you don’t like this, I can put it back.”) Rather, indicate your flexibility in the cover letter. On the manuscript, use queries for giving or asking for information. Don’t track changes that will be invisible or confusing on a black-and-white printout, such as deletions of hyphens. 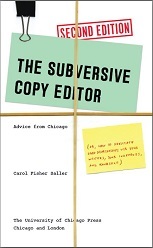 * If the editing is difficult to read, the writer won’t easily see that the results read well. Be conservative in editing until you have more experience. You should be ready to explain every mark you put on the page. Remember the copyeditor’s creed: First, do no harm. *My workaround is to explain in the cover letter that I have edited common compounds silently in accordance with CMOS and Webster’s 11th Collegiate, and that otherwise I track the opening or closing of compounds respectively like this: right_wing or home-townhometown. I remember when my first son was little and I would be listening to music, and John would amaze me by humming a different tune while he played at my feet. Maybe the ability to “tune out” so profoundly is just one of those stages of child brain development, like unintentional writing in mirror image. Or maybe I’m the only one who can’t hum against the music. Whichever it is, I’ve known for quite a while that my mind is pretty much limited to one track at a time. Of course, I’m often forced to multitask. In fact I was inspired to write on this topic the other day when, pressed for time, I found myself flossing during my workout. (I’m not making that up. And yes, I did find muscles I never knew I had.) Once again, I learned that when I do two things at once, one of them suffers in quality. Experience and common sense tell us that when a deadline looms, turning off and tuning out can give us a dose of needed concentration and efficiency. For an hour, say, forget the e-mail, muffle the tweets, and go at it single-mindedly. *Disclaimer: Whenever I mention a study without a citation, it’s possible I’m making it up. **Eyal Ophir et al., “Cognitive Control in Media Multitaskers,” 1. Meticulous, Compulsive . . . and Liberated? Copyeditors have a reputation. We’re conscientious and task-oriented. We like our little routines. We like things tidy. That’s what’s good about us—it’s why we’re useful. We are valued for our tolerance for tedium and our willingness to plug away till the last crumb of typographical trash is off the floor and into the bin. It’s a cliché to say that we’re compulsive perfectionists; that we’re the quiet and unsung heroes of publishing. Doesn’t it get up your nose even a little when a fellow copyeditor gets on a high horse about authorial ignorance? Or trumpets a typo in a published work with shock and indignation? Who’s she kidding? Let’s see everything she’s edited: I’ll bet you a million bucks you and I could find a few crumbs she missed. Copyeditors have to rate among the most self-satisfied and superior folks I know, and it’s not hard to understand why. A body has to work up some kind of defense under the pressure of that reputation. But let’s liberate ourselves from the stereotype. I’ll go first: I admit it. I mess up all the time. It’s how I know things. If you write or copyedit in Microsoft Word, have you thought about using color as a tool? Here are two ways I use color in editing and word-processing. (2) If you have to provide typesetting codes or check someone else’s, and if they’re the kind that are in angle brackets, you can color them in a wildcard search so they’ll “pop” when you’re viewing the document on screen. Hit Ctrl+H, and expand the box with Alt+M (for “more”). Alt+U will turn on the wildcard feature. In the Find box, type \<*\>, and in the Replace box make sure there’s nothing there, not even a space. * Choose a color for the Replace box following the steps in project #1. (I like red for codes.) Let ’er rip. (Replace All.) Everything between angle brackets should now be your favorite color. When you’re finished playing with colors, you can remove them all by repeating the steps in (1) and choosing Automatic as the color. *If there’s a space or any character in the Replace box, there will be unpleasantness when you hit Replace All. But don’t worry—that’s why God gave us Ctrl+Z. Two popular types of bad copyediting are (1) editing that didn’t need doing in the first place, and (2) needed editing that didn’t get done. Both types can be accomplished with or without the aid of a computer, but there are reasons why a copyeditor deploying a word processor is likely to end up committing both. Perfectionists are helpless to resist the tweaking and refining that comes at the peck of a few keys, even if it’s ultimately unhelpful to the publishing process, even if the original was good enough, even if errors are introduced in the meddling. It’s just so darned easy, and it takes only a few seconds. Well, maybe just a few more—oops—that wasn’t what I meant to happen, but that’s okay, because I can fix it . . . oops—wait, I’ve got it now! Sorry, where was I? Oh, yes: talking about editing that didn’t need doing. More laid-back types are no better off if they haven’t mastered the word processor. Freelancers regularly send me work that isn’t properly cleaned and coded. Are they simply blind to all the little e-boogers? Or does it not occur to them that there’s an efficient way to fix them? Either way, we get the type 2 problem of editing that goes undone. The solution doesn’t lie in editing on paper any more than the problem lies in the machine. If all the copyeditors in the world throw themselves in front of that train to Technology, it’s still going to roll on by. Might as well get on. Copyeditors who are allowed to edit on paper are dwindling in number, but judging from my mail, copyeditors who would like to are legion. I don’t get it. For short works, sure—I enjoy scribbling with a pencil, and it’s easy enough to keep track of style choices. But when a manuscript is more than a few pages long, I get twitchy: without proper tools (i.e., a word processor), I’m simply not confident that my work will be up to par. —Searching a document to undo a bad style decision takes a long time and risks missing a few instances. —Some nonessential but desirable tasks that could be done in mere seconds electronically are not feasible on paper. Although we could do them, it would seem wrong to waste the time (in other words, our employers’ money). But, weirdly, that brings me to how word processors can contribute to two kinds of bad editing.